These vegan French dip sandwiches are made with sautéed portobellos, dressed in spicy horseradish mustard and served ready for dipping in savory vegan au jus. Roast beef has never been my thing. I know, you’re shocked! So the idea of a French dip sandwich never appealed to me very much. In fact, I distinctly remember ordering a French dip at Denny’s when I was a little kid, and thinking I’d be getting something involving French onion dip, which definitely was my thing. I was hugely disappointed when a roast beef sandwich with a cup of meat juice showed up. 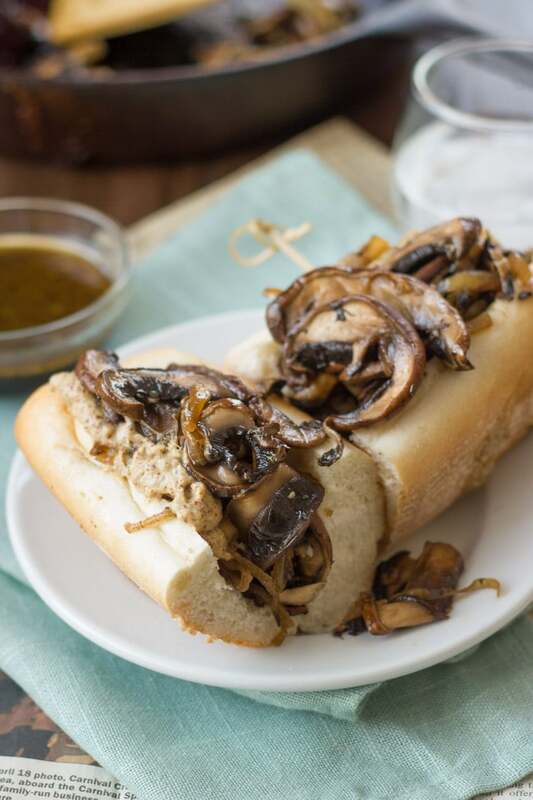 A big messy mushroom sandwich that gets dunked in mushroom juice on the other hand, is way my cup of tea. 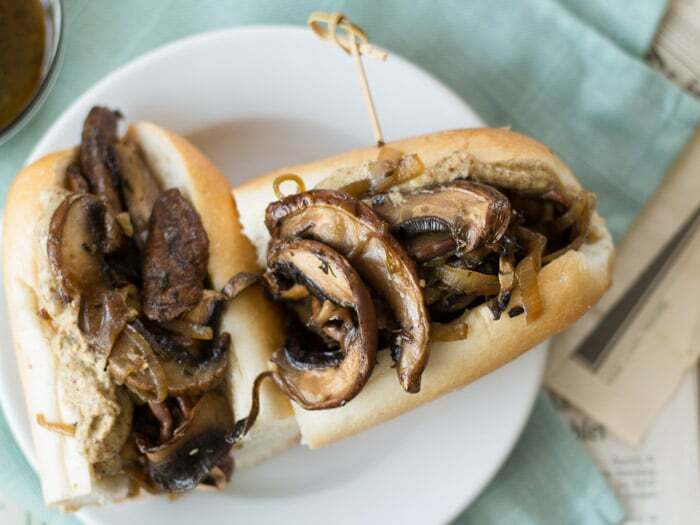 I’m really glad I got over that rough childhood French dip experience, and decided to give it another go, in vegan form, because this sandwich was insane! Flavorful, succulent, sloppy as heck, but so worth the slop for being as tasty as it was. I served my sandwiches with some horseradish mustard and nothing more. That was perfect for me, but I’ve seen recipes calling for spicy mustard, Dijon and mayo. Go with them all if you’d like, assuming you’re prepared for a full-on slop fest. If you’re into vegan cheese, feel free to top it all off with some mozzarella shreds too. Check out how easy these are to make! Coat the bottom of a large skillet with 1 tablespoon of oil and place over medium-low heat. Add onion and toss a few times to coat with oil. Allow to cook until caramelized, about 20 minutes, flipping occasionally. Add garlic and cook about 2 minutes more. Transfer onions and garlic to a plate. Coat skillet with another tablespoon of oil and raise heat to medium. Add mushroom strips. Avoid overcrowding the skillet. A little overlapping is okay, but work in multiple batches if needed (I needed two), adding a bit of oil between batches if needed. Cook until lightly browned, about 5 minutes. Flip and cook 5 minutes more on opposite sides. Return onions to skillet and add broth, soy sauce, Worchestershire sauce, thyme, liquid smoke and pepper. Bring to a simmer and allow to cook, stirring occasionally, until liquid is reduced by half, about 5 minutes. Slather the insides of rolls with horseradish mustard. 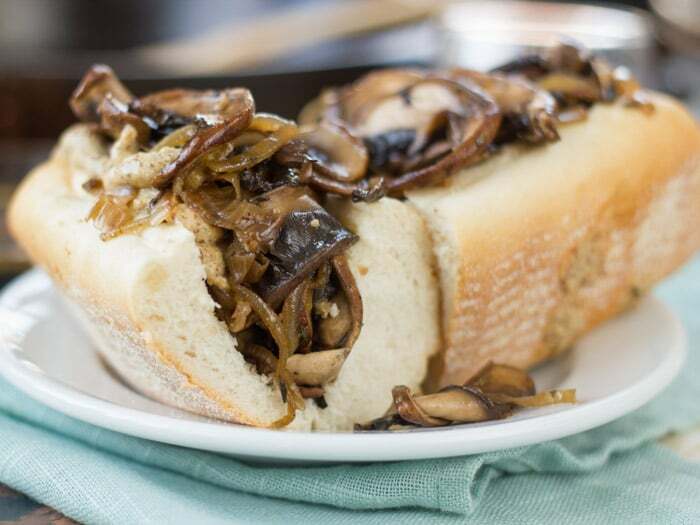 Use a slotted spoon to remove onions and mushrooms from skillet, pressing lightly to squeeze out any excess juice. 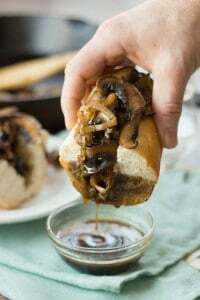 Divide onions and mushrooms into rolls. Pour cooking liquid into a small bowl and serve with sandwiches, for dipping. I’m planning on making this in a couple of hours but just realized I only have 2 mushroom caps! Do you think it will still come out okay? It will probably taste fine, but you’re sandwiches might be a bit skimpy on fillings. Depending on how many people you’re feeding, you might just want to cut back on the batch size or even make smaller sandwiches. I make this all. the. time. and my omni partner will actually request them! Yay!! So happy to hear that! Thanks Chantel! Also wanted to express my gratitude for this AMAZING recipe. And, as a bonus, I like to make extra and take 1 cup of the sauce/mushroom/onions and blend them with one cup soaked almonds + a little nooch and some sun dried tomatoes to make an INSANELY good mushroom pate. It’s tempting to eat it the same day, but 24 hours in the fridge and it is mind blowing. Thanks for all you do! This recipe is one of me and my son’s favorites. It is absolutely amazing. I have tried many of your recipes and have found them all to be delicious. 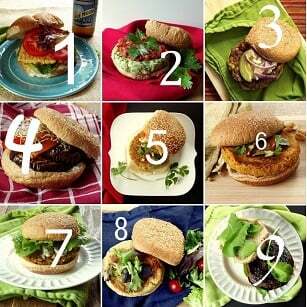 Thank you so much for sharing your great recipes. I’m so glad you’re enjoying the recipes!! Thanks so much Marthanne! I don’t think I’ve ever seen a comment section for a recipe with so few suggestions for substitutions or tweaks. I’m going to have to try this, it’s one of the meals that I miss, thank you! Haha, yes! There are so many ways to switch things up with this one. Enjoy! Made this today finally. Kicking myself for putting it off so long because it is absolutely delicious. Was perfect for this rainy late summer day! Thanks so much! So glad you enjoyed it!! Thanks Jenna! I made this tonight after stumbling across this recipe and am so grateful I did. Only thing I did differently was thicken the broth with some corn starch to make it gravy-like and served it over mashed potatoes. Delicious and completely satisfied my craving for country steak and gravy. Thank you so much! Yay!! I’m so happy to hear you liked them! Thanks Michele! I’m afraid that doesn’t sound familiar to me! I hope you can find it! I’ve really missed beef dip since becoming vegan and this was SO good, it completely satisfied my craving. It will definitely be on regular rotation in our house and it was so easy. Thank you for the great recipe! So happy to hear that! Thanks Sam!! I’m so glad to hear that!! Thanks so much Meg! I made this tonight and it was a big hit with both my husband and myself. I made it without any oil by braising the onions and mushrooms in vegetable broth. It worked beautifully. I used whole wheat hamburger buns and that was nice also. We did not use and mustard or horseradish but loved it all the same. We will definitely be making this again soon. Thank you for sharing. I’m so glad you enjoyed them! And that’s great to hear that your oil free method worked out well! Thanks Lori!